The insurance BPO market will hit $5 billion this year, growing at a 5% clip and has proven to be one of the select verticals truly embracing technology enabled BPO capability to support operations. The insurance market has become incredibly competitive in recent years, with the differentiation across insurers moving to customer service and brand perception, once price points are relatively similar across the reputable firms. HfS has evaluated the innovation and execution capabilities of service providers catering to life and annuities (L&A) and property and casualty (P&C) insurers, brokers, reinsurers and others (excluding healthcare). We asked Research Director leading the blueprint initiative, Reetika Joshi, to elaborate further on the results of the exhaustive study. 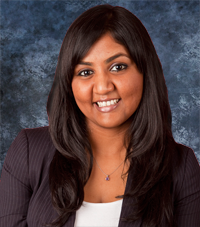 Reetika, what are the key challenges facing insurers today? The key challenges global insurers in our study face are regulatory compliance, member retention, reducing total cost to service, integration efforts for aggressive acquisitions, multi-line agency management, profitable growth in new markets (esp. for L&A), pricing pressure (esp. for P&C) and most importantly, risk management. Our conversations with these insurers and their service providers, along with exhaustive secondary research reveal the changing mindset of buyers in this industry. Insurance clients’ outsourcing motivations are slowly starting to change, going from task outsourcing and optimization to impacting total cost to serve, cost of compliance, organization level efficiency and insight generation – in line with core organizational challenges. How are service providers adding value beyond basic low cost staff augmentation? Clients are increasingly looking to their service providers to help them with these business outcomes (part of what HfS calls “progressive outsourcing”) which goes beyond traditional, transactional “lights-on outsourcing”. Insurers are continuing to expand the scope of their processes with service providers to include more high-value, complex and core functions such as actuarial and underwriting support, agency network optimization and analytics across areas such as new product, risk and claims. However, service provider capabilities in these service areas are not consistent. Clients are more willing to entrust execution of complex processes to market leading service providers. Further, the delay in decision making around closed block administration outsourcing is starting to give way to a host of new contracts in the last two years. North American insurers are the source for the vast majority of these deals since 2011. Our research sizes the global insurance BPO market at $4.72 billion in 2013, growing at a CAGR of 4.6% to reach $6.19 billion in 2018. For the scope of this study, we have excluded the traditional third party administrator (TPA)/loss adjustment segments as we believe the competitive dynamics of the outsourcing provider group is unique. So how did they winners shake out? These service providers have robust global delivery capabilities, demonstrated expertise across the core insurance BPO services value chain, have exceptional account management and client engagement efforts. Accenture, EXL, Genpact, IBM and TCS have all made significant investments in insurance technology to offer integrated technology and business process solutions to clients. Further, they are committed to future investments in the insurance vertical and delivering value beyond cost by consistently engaging with their customers on vertical-specific innovations. Their forward-thinking vision for the future scope of insurance BPO has helped clients realize benefits from the use of emerging technologies, continuous improvements efforts and regulatory compliance vigilance. We recognize Accenture, Genpact and IBM for leading overall Execution, while Accenture, EXL and Genpact lead Innovation in global insurance BPO. High Performers Represent Strong Competition. High Performing service providers including Capita, Cognizant, CSC, Infosys, Wipro, WNS and Xchanging have strong execution skills and existing market share. Our study suggests that of this group, Capita, Cognizant, Infosys and WNS will prove to be strong competitors to the Winner’s Circle in the medium term. This is due to their significant commitments to the insurance vertical and investments in innovation capabilities that require time to mature. And finally, Reetika, what are the key takeaways? » Most buyers are unimpressed with technology enablers in use today – time to invest in real “value add”. Our primary research with a diverse group of insurers across geographies reveals that most buyers are ambivalent about the performance of technology enablers embedded in their BPO operations today (including reporting dashboards and other tool kits). 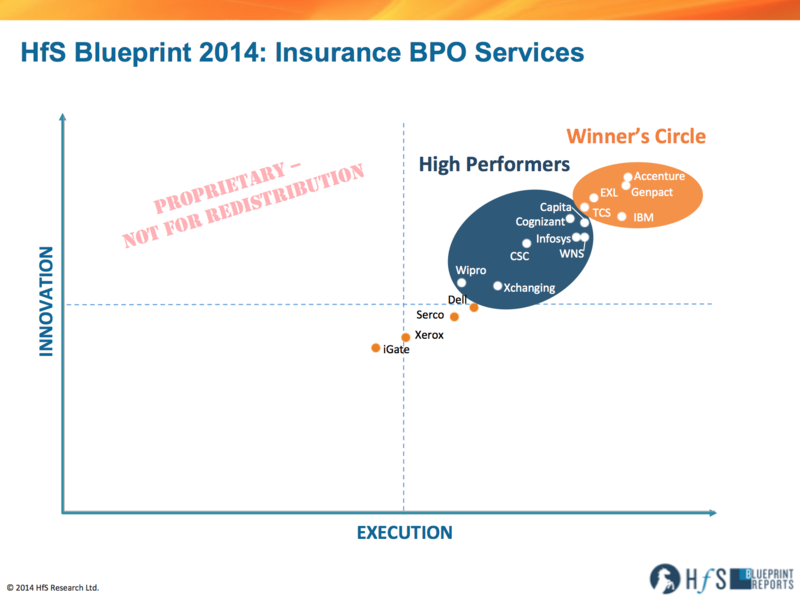 Bar a couple outperformers, service providers need to address client expectations and improve the standard technology enablers provided to their insurance BPO clients. » Buyers most swayed by talent management – at the operations level as well as account management. Insurers are highly vocal about how critical the talent brought in by service providers is to client satisfaction. Account managers are one such layer where buyers appreciate prior insurance industry experience apart from account management skills. Further, the industry knowledge and local domain expertise of BPO teams is highly valued by clients, and cited as one of the most important reasons for client satisfaction. » Service providers of all categories have upped their game on industry knowledge – differentiation will now come from niches. We found numerous examples of efforts by service providers to impact outcomes through industry-specific solutions. Clients have consistently attested to their service providers’ level of knowledge on domain-specific processes including complex service areas, regulatory compliance and reporting knowledge and nuances of different market segments and niches. What this implies is that insurance industry knowledge is now becoming the norm, and will no longer be a source of differentiation in and of itself. Service providers will need to dig deeper into their niches within different market segments and geographic markets to push the envelope on further differentiation. » Buyers are yet to see a proactive and consistent approach to innovation from their service providers. Our research finds that buyers and service providers have not yet tapped collaboration opportunities for disruptive innovation. Most innovation effected so far has had incremental operational and financial benefits for insurers. » Regulatory support and compliance is top of mind for both buyers and service providers. Both clients and service providers are very aware of the possibilities of working together to improve regulatory compliance and support. Even if it doesn’t translate into actual business right now for all insurers, this is definitely an area where we see an increased scope for work in the near future. Thanks, Reetika, for an excellent synopsis of the new blueprint. Definitely, to keep ahead in insurance market, Insurance firms need to invest every cent in advertising cost as its becoming immense margins for insurance firms.For impacting cost level efficiency the above mentioned website can also be beneficial.